When you want to wear a brim hat but don't want the full size brim like a fedora, that is the time for wearing a stingy brim hat by Steven Land. 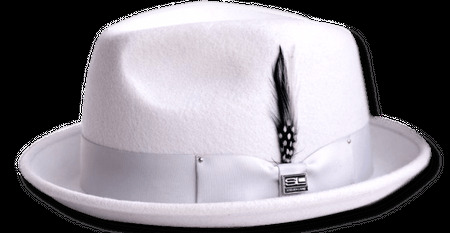 Steven Land is a designer that has been known for this shirts and big knot silk ties has just released his collection of dress hats just like this silver stingy brim hat. This fine stingy brim hat is made of Cashmere feel Australian wool felt and comes with a silky satin lining.